The fifth Ticonderoga (CG-47) was laid down on 21 January 1980 at Pascagoula, Miss., by the Ingalls Shipbuilding Division of Litton Industries; launched on 25 April 1981; sponsored by Mrs. Nancy Reagan, wife of then President Ronald Reagan; and commissioned 22 January 1983 - the first of twenty-seven ships of her class. An extensive test and check-out effort and outfitting period was then undertaken as the mighty hull was brought to life. Ticonderoga men arrived in Pascagoula in July 1981 and crew training, certification and systems check-out were underway. Sea trials were held in May, August, and November of 1982. During the first trial, Ticonderoga's propulsion systems were stringently tested, passing with flying colors. The new cruiser accomplished a four-hour run at full power, achieving a speed in excess of 30 knots. On its second trial, Ticonderoga and her Navy crew accomplished an unprecedented "Navy First." She flexed her muscles for the first time, 6 months prior to commissioning, by successfully firing every weapon system on board. This included two Anti-Surface Harpoon Blast Test Missiles, 11 Surface-to-Air Blast Test Missiles, 5"/54-Caliber Gun Ammunition, CIWS and, finally, two Standard Surface-to-Air Missiles against drone air targets off Eglin Missile Range. The latter was a complete success, and the Ticonderoga, "the First and Formidable," had truly accomplished a "first" with Ticonderoga men manning and firing the combat system in cooperation with Ingalls' employees and civilian contractors. Ticonderoga was delivered to the Navy on 13 December 1982. Following commissioning, she moved to Norfolk, her home port. During the next year, CG 47 was scheduled to participate in extensive Combat System and Engineering Exercises, as well as intensive single ship and Battle Group readiness evolutions. She returnd to Pascagoula in the Summer for a six-week Post-Shakedown Availability. Cruiser construction went on in the shipyard as it continued to build the second, third, and fourth Ticonderoga Class cruisers. But for Ticonderoga, it was time to undertake the duty for which she was built, as she brought her strength and power into the service for her country. Ticonderoga sailed from Pascagoula in February, truly "Combat Ready," with a demanding schedule ahead, and with the knowledge that her systems, construction, and the Ticonderoga men who man her are the very best. "Stand by Admiral Gorshkov, AEGIS is at sea." Ticonderoga was built in sections, called modules, which allowed improved access to all areas of the ship during construction. The modules were then moved together to form the hull of the ship, and the deckhouse sections were then lifted aboard. For launching, the ship was moved several hundred yards across land to the floating dry dock, which was used to actually launch the ship. Ticonderoga took part, in May 1995, in an 11-day exercise, called Destined Glory '95, The exercise took place in the western Mediterranean south of Sardinia and included more than 20 ships and thousands of troops from the NATO countries of Greece, Italy, Netherlands, Spain, Turkey, U.K. and the U.S. This marked the first time, NATO countries conducted a fully integrated amphibious exercise in an air, land and sea training environment. The Ticonderoga was in the Mediterranean as part of the Theodore Roosevelt Battle Group, having left its homeport on March 22. 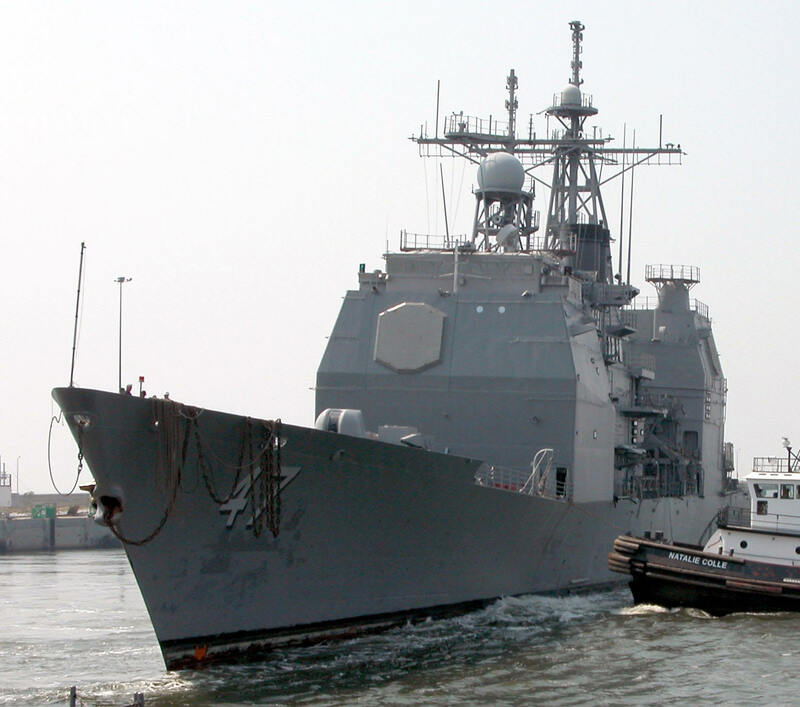 It deployed with the Theordore Roosevelt and other battle group ships to the Arabian Gulf in support of Operation Southern Watch, the enforcement of the no-fly zone over Iraq. It then deployed back to the Adriatic to take station for Operation Deny Flight, the U.N.-mandated no-fly zone over Bosnia. The Roosevelt reported on station May 26. The Ticonderoga relocated to Pascagoula, MS, in 1996, after being tasked primarily with supporting operations in the Caribbean and South America. 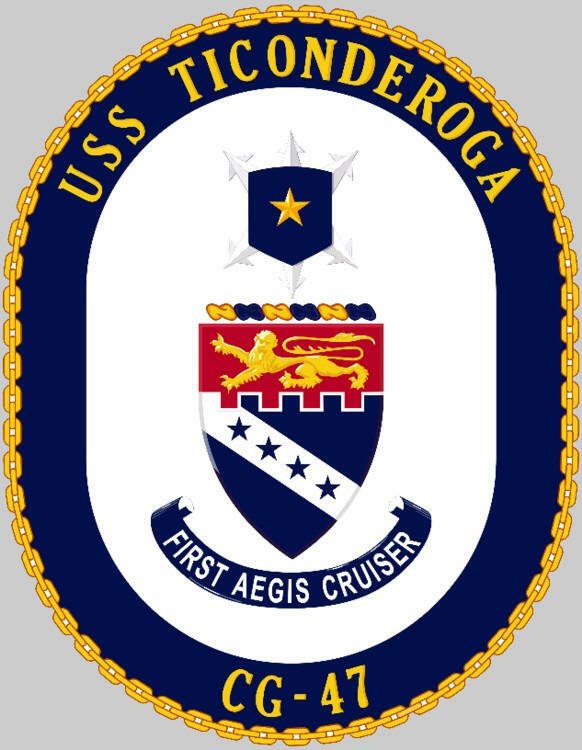 Ticonderoga as the first production Smart Ship cruiser fielded in the summer of 2000, undergoing the upgrade at Naval Station Pascagoula. After fourteen long months of installations and ship alterations, Ticonderoga completed sea trials. The crew next prepared for various readiness and operational inspections. Light Off Assessment (LOA) was conducted in late May prior to sea trials and Engineering Department put in numerous off-duty hours preparing the ship’s engineering spaces. Sea trials with the new SMART SHIP program went smoothly on June 1st and 2nd without any major problems. 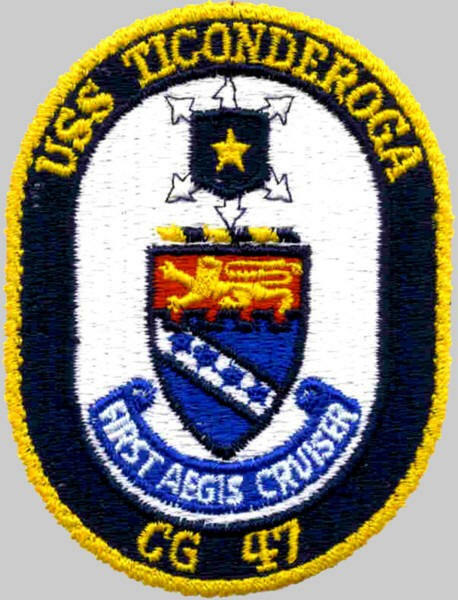 Ticonderoga took part in the mid-October 2000, Atlantic phase of the 41st annual "Unitas" Task Group deployment. The purpose of "Unitas" is to conduct multi-lateral naval operations including traditional at-sea exercises and inport activities with participating naval forces in support of U.S. foreign policy in South America. During the Atlantic phase, the Ticonderoga made a stop at the port city of Ushuaia, located in the Patagonia region on the southern tip of Argentina, which it departed from on October 4th. 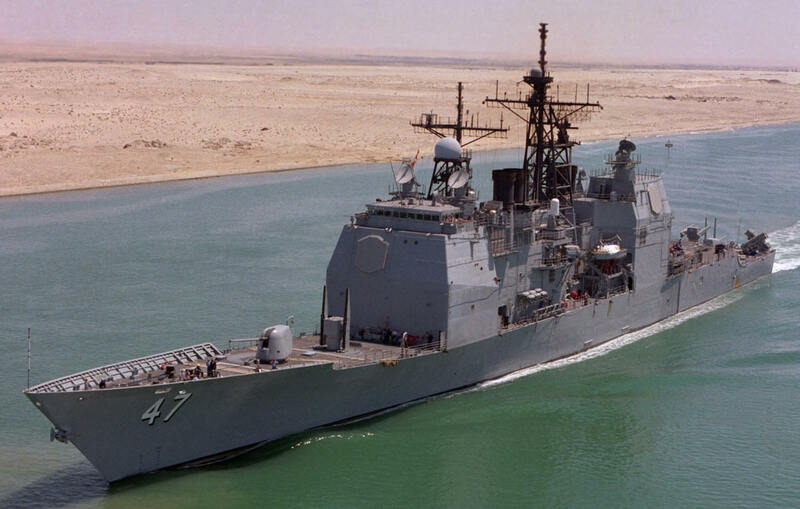 The vessel later visited Rio de Janeiro, Brazil, October 23, 2000, as part of a four U.S. Navy ships contingent. 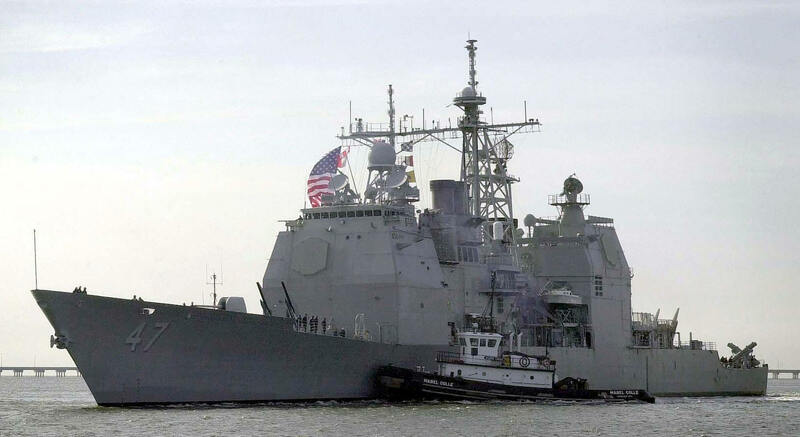 After a holiday vacation, the crew of America’s First Aegis Cruiser returned to sea in late January to mid-February 2001. Ticonderoga served as flagship for DESTROYER SQUADRON SIX, its immediate superior in charge, and completed a Group Sail with several other ships in the squadron. 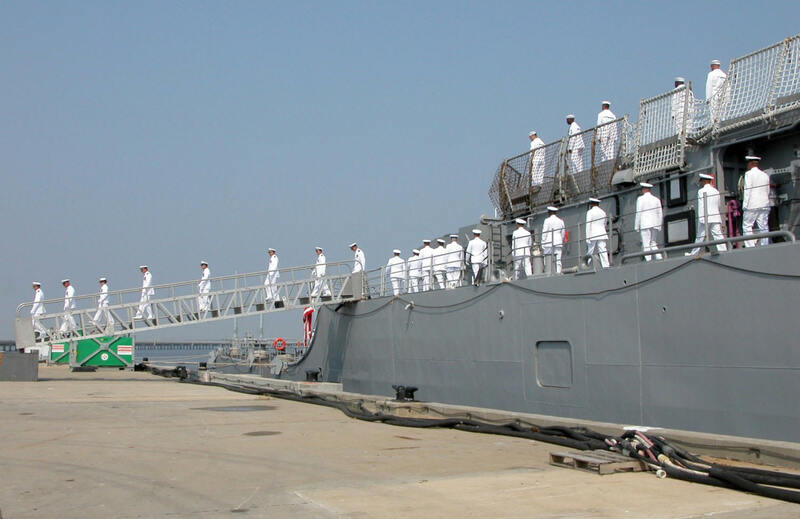 Events included tactical maneuvering, seamanship exercises, communications drills, and electronic warfare exercises to prepare for upcoming deployments. Each ship had the opportunity to fire a Standard missile to maintain combat readiness standards. The missile launches were the highlight of the Group Sail. 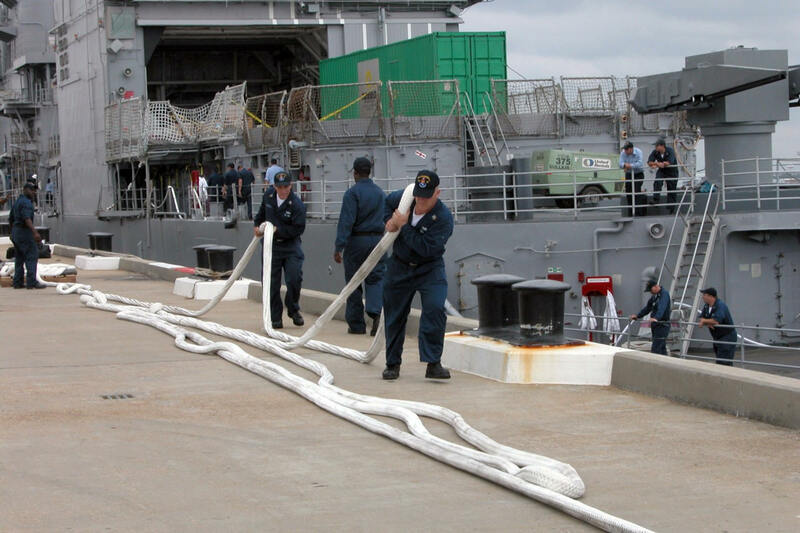 Ticonderoga’s crew next prepared for INSURV, a mandated inspection that occurs on board each U.S. Navy ship every five years. The inspection is a material and systems readiness assessment to prove how well a crew has maintained their ship. 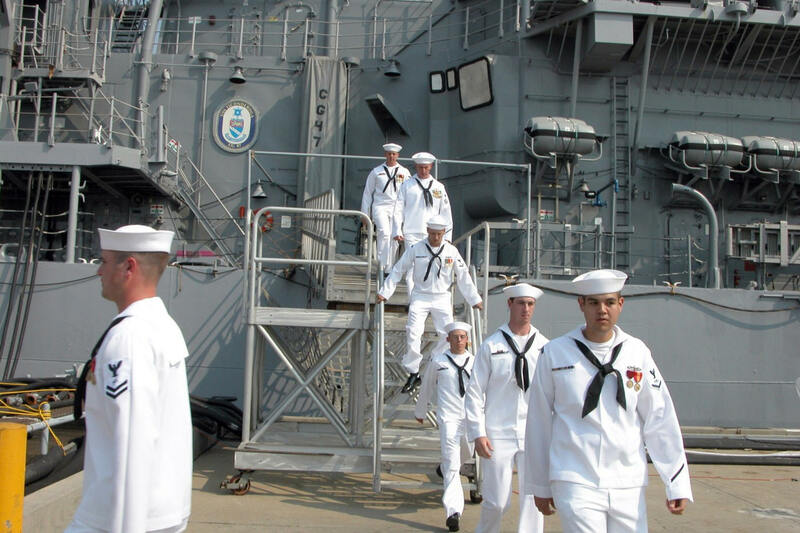 Many crewmembers have dedicated numerous off-duty hours to ensure all navigation, engineering, electronic, and combat systems equipment are ready for the inspection. In the following months, Ticonderoga was to loosen all lines and deploy in support of U.S. Southern Command operations. USS Ticonderoga participated in Teamwork South, a series of challenging naval exercises in the Southeastern Pacific Ocean with Rodney M. Davis (FFG-60), twelve Chilean warships and the British Destroyer HMS Edinburgh (D-97). The exercise was completed in mid-July 2001 and included a live fire Sink Exercise (SINKEX) on the ex-USS La Moure County (LST-1194) unmanned hulk target, which had been decommissioned after an accident off the coast of Chile the previous year and whose use as a target was determined to outweigh the cost of potential repairs. Bender Shipbuilding & Repair Co. Inc., Mobile, AL, was awarded a $7,990,455 firm-fixed-price modification to a previously awarded contract for the drydocking selected restricted availability of the Ticonderoga. As of January 2002, work was to be performed in Mobile, AL, and was expected to be completed by June 2002. 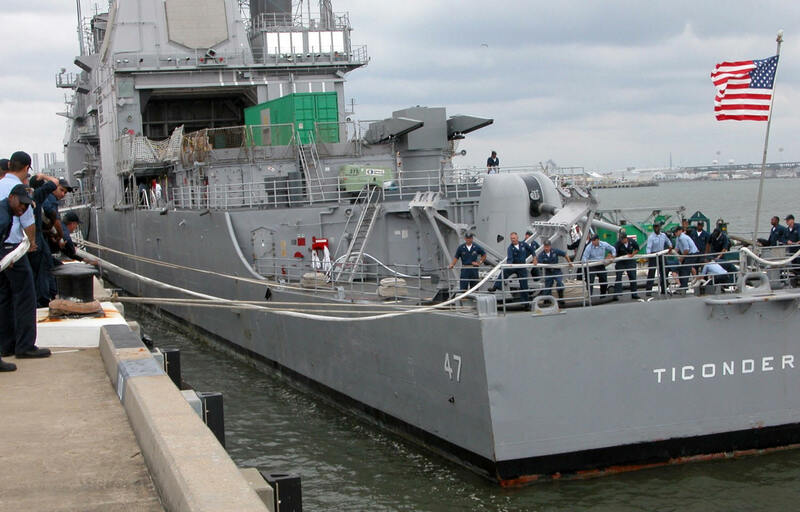 Ticonderoga departed its homeport at Naval Station Pascagoula for its final deployment 10 March 2004. While deployed, the ship conducted counter-drug operations in the eastern Pacific Ocean and Caribbean Sea, and then participated in UNITAS operations off the coast of South America. On 30 June 2004, she stopped a fast boat with 72 bales of cocaine aboard - a street value of $36 million. Returning to Pascagoula on 3 August, she set a record for counter-drug operations netting more than 7 tons of cocaine and detaining 25 suspects. Ticonderoga was decommissioned 30 September 2004 but retained in high maintenance as a surge asset. 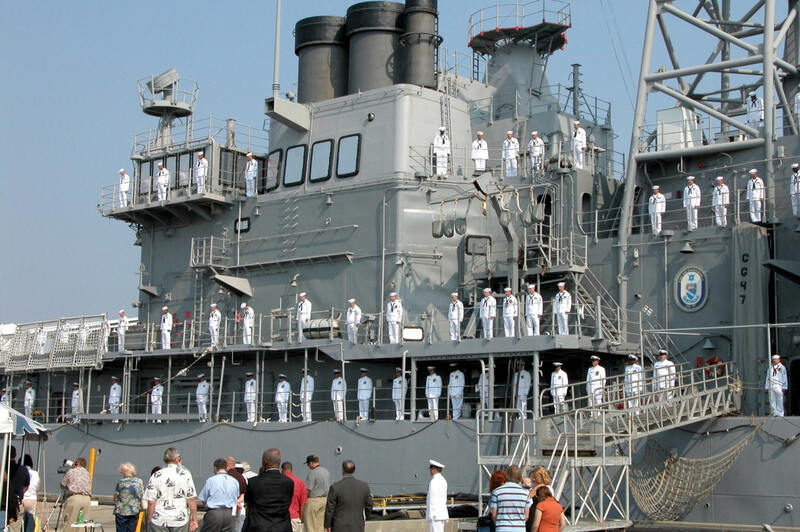 After her decommissioning, she was towed to the Naval Inactive Ship Maintenance Facility in Philadelphia. Recently, however, she was put up for museum donation by the Navy and there is a strong effort to bring Ticonderoga to Pascagoula, Mississippi, where she was built, to serve as a museum ship.